This is one of those recipes I end up making most years around this time, it usually starts out as a chocolate fondue with the left overs turned into chocolate truffles. We’ve never managed to eat all of the fondue as it’s just so rich so I don’t even both making extra unless I want a lot of truffles. In a saucepan, gently heat the chocolate and cream together until the chocolate has just melted – do not boil. Add the booze and stir thoroughly. You can use it still warm as a chocolate fondue or sauce, cool for a while and use as cake filling or covering or cool thoroughly and shape into truffles. A little goes a long way. i thought I’d try a recipe I saw on Facebook. 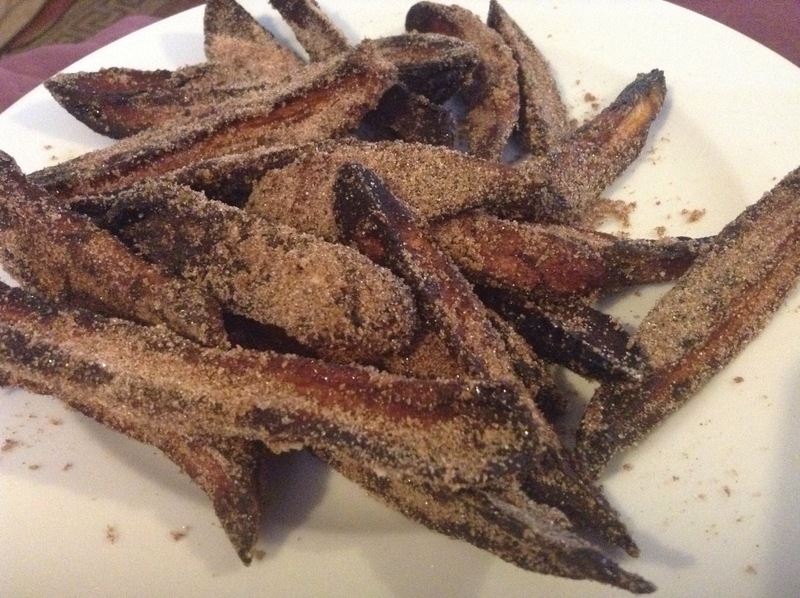 Cinnamon and sugar coated sweet potato chips. It didn’t go so well. I was trying to work at the same time as cooking and left them in the oven too long. Even the tasty coating couldn’t save them. At least I was able to eat enough to realise that the idea is worth trying again sometime. It’s a bit on the chunky side, but I like it that way. If I was making it to share I’d probably make it finer just to be posh. It’s the easiest thing in the world to make and so flavoursome, it’s even healthy! I don’t know why I don’t have it every day. 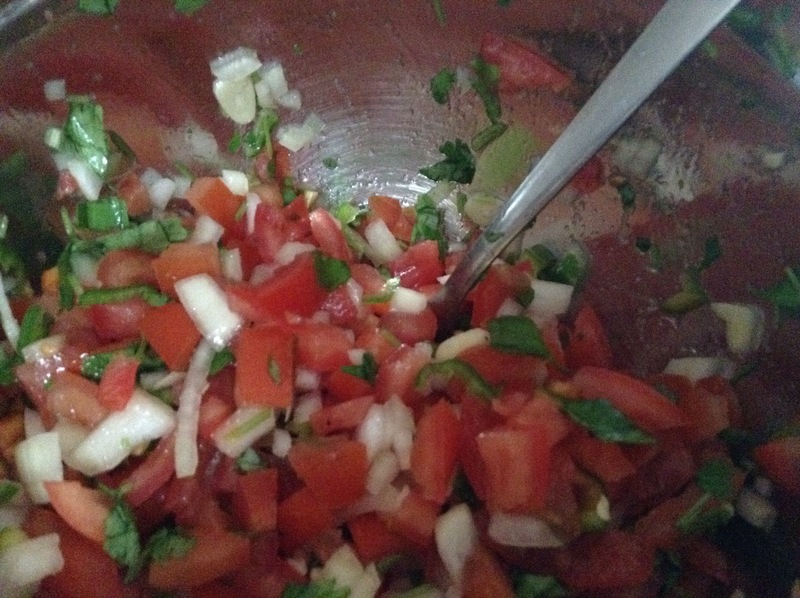 All you need is tomatoes, onions, a couple of chillis, a clove of garlic, some fresh coriander and lime juice. The exact proportions don’t matter, it’s just a case of mixing until you get the balance that works for you. Everyone makes it slightly differently and they all taste great. Mine has – 12 smallish tomatoes, one small onion, one clove garlic, 2 green chillis, a handful of coriander leaf and the juice of one lime. 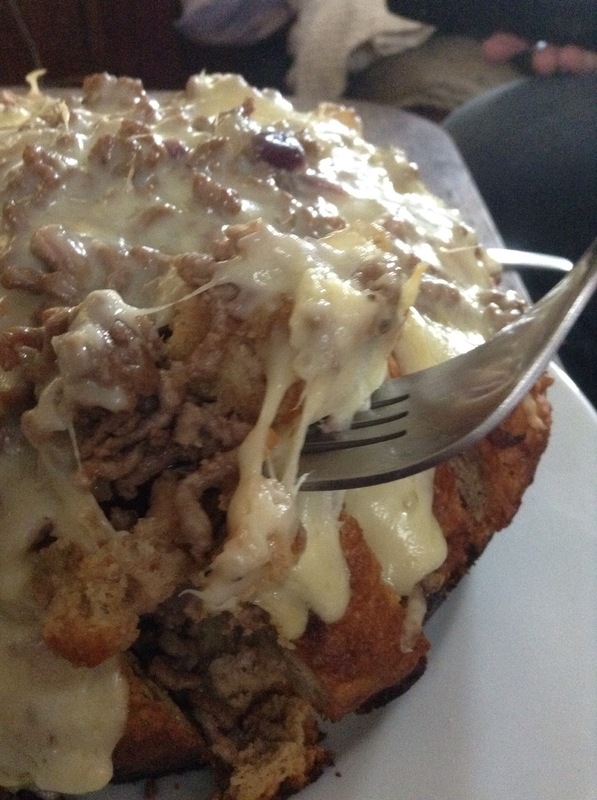 Cut almost all the way through a loaf to make squares about an inch across, stuff cooked seasoned minced beef and grated cheese into the gaps and put in a warm oven until the cheese melts. Yum! You’d be amazed how quickly a loaf can disappear. Next time I’m going to use chilli instead of hamburger and top with jalapeños and guacamole. Mix everything together in a bowl. 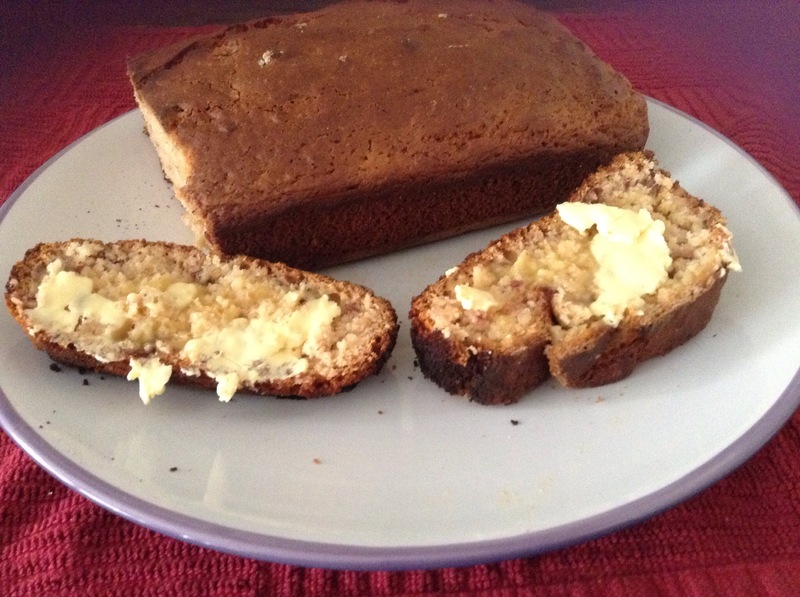 Pour into a buttered loaf pan. Cook at 175/350 for about an hour. Remove from the tin to cool – although I’m not very good at that part and end up eating it still warm from the oven. I’m sure you could swap the cranberry for redcurrant or apple sauce and it would still work. I’m also planning on trying this with elderberry once I’ve picked some later in the year. 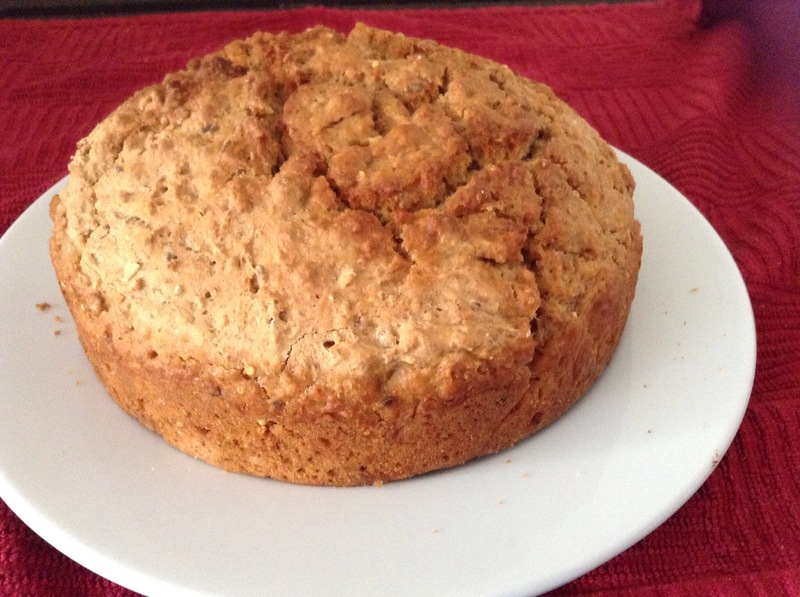 It’s so much easier than ordinary bread, only takes a few minutes to mix. You can also add any flavourings you fancy so mine has some Italian herbs and crushed garlic. This is completely optional though. Just stir together – you can even mix in the cooking tin for minimal washing up. 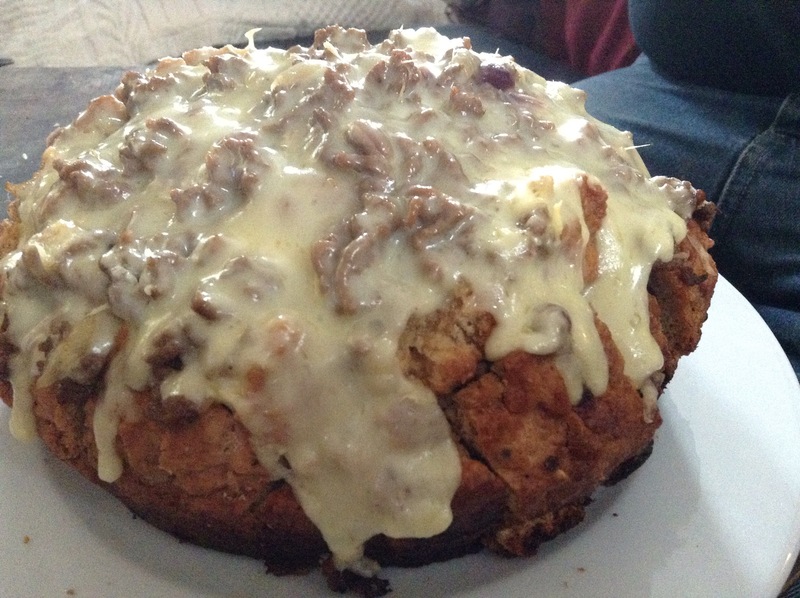 It’s designed to be baked in a regular loaf tin but I wanted mine round so used a cake tin. Some recipes say to pour over some melted butter, I was running a bit low on butter so used a tablespoon of garlic infused olive oil instead. Tomorrow is Gary’s birthday, and since he is a wonderful husband I figured it only fair that he should get cake. So when he went out to work this evening I got busy and made a gin and lemon cake. (Just a basic sponge but using gin and lemon juice in place of water). 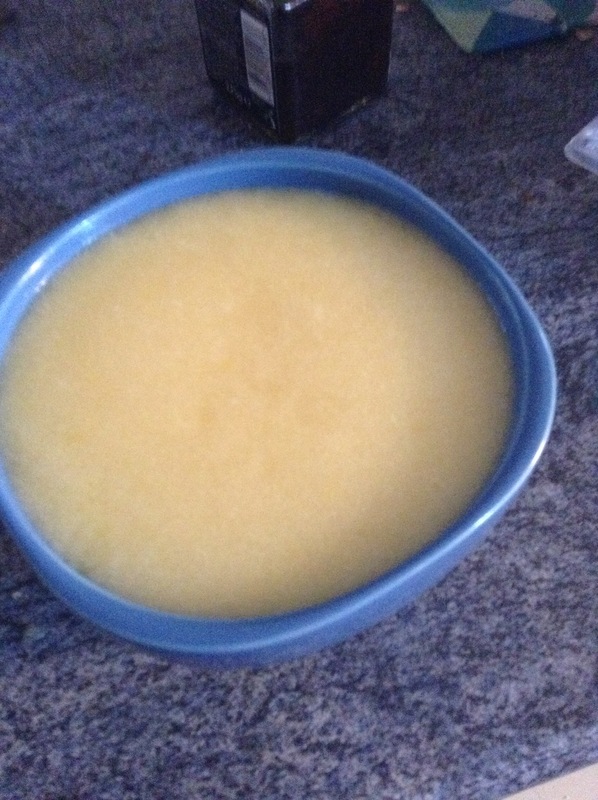 Then I decided it needed a lemony filling so I had my first ever attempt at making lemon curd. I didn’t have a recipe so had to improvise based on what I’d seen on TV programmes like masterchef. I had half a bottle of lemon juice to which I added 2 eggs, a cup of caster sugar and about a third a block of butter. All very approximate as I didn’t have a recipe. I whisked everything other than the butter together first then cooked it until it had thickened and then melted in the butter before whisking again.